Property Details: 2 Bedroom, 2 Bathroom Waterfront Home, 1400+ sq. 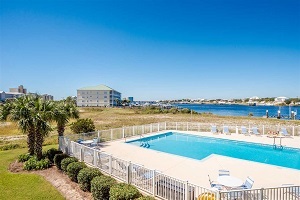 ft.
Jubilee Landing condo, beach resort home in Orange Beach for sale. This complex offers a separate boat/trailer storage lot.This unit comes with a storage unit and the complex is equipped with an elevator. This complex is known to cater to fishing and boating and has 10 shared FIRST COME FIRST SERVE BOAT SLIPS.This unit has a west facing balcony which provides beautiful views of sunsets on Old River. The Jubilee Landing Complex is located in a unique location as it offers a River and Gulf View from almost anywhere, even the front door! This complex has covered parking, oversized pool for a 33 unit complex, fishing dock, outdoor BBQ grills, covered picnic area and a gazebo.This complex replaced the balcony floors and the roof, just last year. EASY TO SHOW. Unit 108 is beautifully furnished and was totally renovated just 2 years ago. The AC is 13 months old and the owner just spent over 10K for all new kitchen appliances. This unit also comes with a den that can be closed off to make an additional bedroom.